A colony ship preparing for departure. Domus Diaspora, often referred to as the Colonial Era, is the historical term applied to the period of rapid interstellar colonization that began in the early twenty-fourth century. This period of humanity's history saw the mass exodus of huge numbers of colonists, enabled by the discovery of faster-than-light travel, headed for alien worlds beyond the bounds of the Sol system. This explosive growth would result in over eight hundred habitable worlds falling into the Unified Earth Government's sphere of control and, within two-hundred years, billions of people would be living and dying outside of the Sol system. However, this period also laid the seeds of future conflict, creating tensions that would eventually erupt into the Insurrection. In the late 21st century and throughout the 22nd century, humans expanded from the overpopulated Earth to colonize other worlds in the Sol system, including Luna, Mars, and the Galilean moons of Jupiter. However, as new philosophies spread among these new colonies, new factions with militant ideologies rose to oppose the United Nations and its Unified Earth Government. These conflicts eventually led to the Interplanetary War, fought across Earth and humanity's new colonies. The war was brought to an end with the United Nations' newly established United Nations Space Command, formed with the consolidation of power with Earth's technocrats. In the aftermath of the Interplanetary War, the Unified Earth Government rose to power as the dominant governing body of humanity's colonies, with the UNSC serving as its subordinate military branch. The invention of the Shaw-Fujikawa Translight Engine initiated the Domus Diaspora. The aftermath of the Interplanetary War left the Unified Earth Government with a different threat, overpopulation and a massive military with no enemy to fight. The post-war period saw massive growths in population on Earth and on her colonies, as well as increasing famine among the populace bred from the Rainforest Wars. These situations threatened to destabilize the economy. However, in April 2291, a team of researchers, physicists, and mathematicians led by Doctors Wallace Fujikawa and Tobias Fleming Shaw saw the invention of the Shaw-Fujikawa Translight Engine, a device that allowed ships to travel slipstream space to traverse interstellar distances. In 2310, the Unified Earth Government unveiled their first line of colony ships, designed to bring rigorously tested, highly qualified colonists and military personnel to settle nearby worlds. In theory, only the best-qualified citizens and soldiers were allowed to colonize humanity's new colonies, leading to the formation of the Inner Colonies. It was at this time that the Colonial Administration Authority was established by the Unified Earth Government as an agency tasked with the governing of human colonies and the direction of further colonization efforts. The Colonial Military Administration was formed alongside the CAA, to serve as the military body responsible for protecting the UEG's extra-solar colonies, while the United Nations Space Command largely kept their operations confined to the Sol system. The Colonial Administration Authority proceeded to spend the upcoming decades preparing and organizing for the inevitable exodus that would occur. The Domus Diaspora officially began on January 1, 2362, when Odyssey and a fleet of nearly one hundred other colony ships were launched from mooring platforms orbiting Luna to Epsilon Eridani to colonize Reach, as well as Tribute and Circumstance in the following years. Despite early successes, for the first decades of the Domus Diaspora, colonization efforts faced significant challenges in marshalling political and economic support. The Epsilon Eridani system, home to an improbably high number of worlds within the habitable zone of the system's host star, became a prime candidate for colonization efforts and succeeded in bringing more attention to colonization efforts. The first colonies formed in the Domus Diaspora were established on verdant worlds and above resource-rich moons. As early terraforming efforts resulted in a lengthy process depending on the conditions of the world, already habitable worlds—however rare—were preferred by the Unified Earth Government's expansion effort. Habitable worlds that could be quickly reached through slipspace soon housed sprawling cities and orbital factories connected through trade and the influence of massive interstellar corporations. Following colonizing successes and improvements in slipspace navigation spurred further exploration increasingly distant from Sol. For a time, much of the Unified Earth Government's resources were directed towards further colonial expansion. By 2390, the Inner Colonies were formally established, consisting of 210 worlds in various stages of terraforming. The population burden across human space had largely stabilized in the Domus Diaspora. In subsequent years, the Inner Colonies exponentially grew and prospered, drawing in investment and building infrastructure extensive enough to become self-sufficient and send their surpluses back to Earth. Meanwhile, smaller colonies and outposts of the greater human civilization spread ever outward along slipspace routes from this developed and tightly controlled zone to become the Outer Colonies. By the beginning of the twenty-fifth century, humanity had colonized over eight hundred colonies, existing on planets, moons, asteroids, mining facilities, and relay stations. 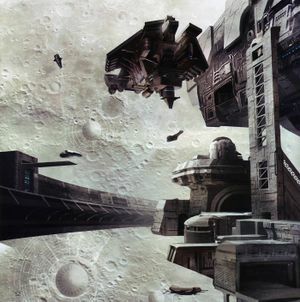 The Inner Colonies consisted of strong, densely populated worlds located close to Earth via slipspace, ranging from prominent military and commercial centers such as Reach and Tribute to comparatively smaller colonies such as Actium, Ballast, Chi Rho, Luyten, Miridem, and New Carthage. Many of the Outer Colonies served as agricultural or mining colonies, providing resources for Inner Colonies and industrial Outer Colonies like Meridian. The Inner Colonies became the political and economical center for the Unified Earth Government, as they began to rely on the Outer Colonies for natural resources. Meanwhile, the United Nations Space Command began to expand its domain to the Inner Colonies, making Earth and Reach the centers of its power, while pushing the Colonial Military Administration to the Outer Colonies. Despite the prosperity and unprecedented growth and development humanity experienced during this time, tensions soon rose on some of the more remote colonies that sought independence from the Unified Earth Government. From 2475 to 2483, a number of civilian uprisings occurred throughout human space. The Colonial Military Administration responded swiftly and severely, though the organization's heavy handed tactics only served to increase resistance. Soon, many citizens on Outer Colonies, and even Inner Colonies, began questioning the often-draconian measures used by the CMA and UNSC to keep colonies in line. Seeking sovereignty on the behalf of a dozen worlds, the newly established Secessionist Union and People's Occupation submitted formal requests to the Unified Earth Government demanding independence. As these requests were left denied, tensions began to rise amongst the Outer Colonies. These tensions eventually erupted into the Insurrection, a civil war that engulfed numerous colonies. "Domus, -ūs" is a Latin word meaning "house" or "household"; while "Diaspora", from Greek, refers to "the movement, migration, or scattering of a people away from an established or ancestral homeland". This is therefore an appropriate name for humanity's period of interstellar travel, as masses of people left humanity's homeland in the Sol system, just as many Jews were forced out of Palestine or Irish out of Ireland in other well-known diaspora.